Show in style with this fancy show halter. This leather halter is doubled & stitched throughout with etched "silver” trim on cheeks & nose, double silver buckle crown with silver keepers & tips, enraves rings, 3 way adjustable under chin, and rolled & wired throat with snap. Cheeks measure 7” not including hardware with overall largest measurement of 41". Comes with matching lead with 28" chain for total length of 7'. Brand unknown, leather is probably imported, silver is the cheapie silver. New, never used, some tarnish on silver. Lovely doubled & stitched medium chestnut leather show halter with scalloped silver bars on cheeks & nose, silver buckles, keepers & tips, black stitching, rubbed & darkened edges, double buckle crown, 3 way adjustable under chin, with rolled & wired throat. Not stamped as to maker, this is a quality piece similar to Kathy’s Show Tack, Circle Y, Tory, Weaver, etc. Silver is stamped on back Sterling Overlay, some triangle & oval designs & what looks like Mexico. Cheeks measure approx 6 1/2” long not including hardware & this fit a Class B miniature horse although a little larger under chin area, so should fit a Pony, or Weanling Horse. Excellent used condition, some dark staining to leather under chin. Photo of this halter on a Class B Mini Horse is shown. Lovely doubled & stitched dark leather show halter with silver bars on cheeks & nose, black stitching, rubbed & darkened edges, double buckle crown, 3 way adjustable under chin, with rolled & wired throat. Simple buckles at crown are removable with Chicago screws so fancier buckles could be added. Not stamped as to maker, this is a quality piece similar to Circle Y, Tory, Weaver, etc. Cheeks measure almost 6 1/2” long not including hardware & this fit a Class B miniature horse, so should fit a Pony, or Weanling Horse. Excellent used condition, some dark staining to leather under chin. 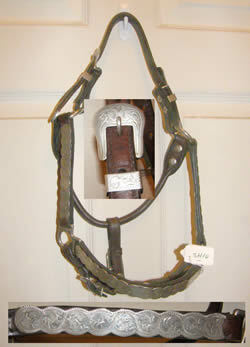 Photo of this halter on a B Mini Horse is shown. Silver bars on nose, silver buckles, keepers & tips. 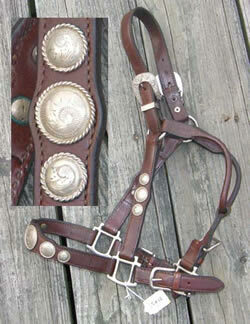 Double buckle crown, 3 way adjustable under chin, rolled throat. Measurements are as follows: Noseband approx 24" as adjusted now with 2 holes on each side to make smaller & 1 hole each side to make bigger. Crown approx 35" from start of ring to end of ring around entire crown with 2 holes on each side to make bigger & smaller. Cheeks(included in above measurement) are 7 1/4" not including rings & have no silver on them. Leather is soft, supple, quality leather but find no maker marks on it, so brand unknown. Silver is not the cheapie stuff, but not German silver either, so may be sterling plated, no markings on back of buckles. Etched "silver" has golden details w/silver trim on cheeks & nose, silver buckles, keepers & tips, etched rings. Double buckle crown, 3 way adjustable under chin, snap at throat. Cheeks measure almost 7" not including rings. Like new hardly used condition. Brand unknown. Great starter halter. 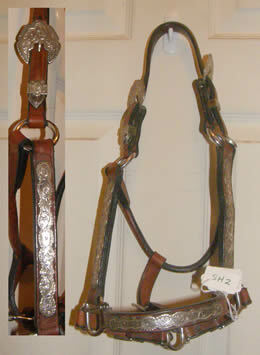 Absolutely stunning Circle Y western leather show halter with loads of engraved German Silver! This halter appears to be yearling sized and measurements are provided below. It has been hardly used and is in excellent condition. It is stamped with “Circle Y 419 7” and is a light oil or chestnut color with white contrast stitching. 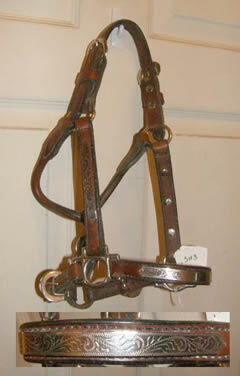 This halter has large engraved silver on the cheek pieces & noseband, large silver buckles, keepers & tips. Buckles are stamped Mexico on the back. This halter is adjustable on both sides of the crown, 3-way adjustable at the chin and has a rolled and shaped throatlatch. It is beautifully made with immaculate craftsmanship and this is a very high quality halter that is made from the best quality leather. The following measurements do not include hardware. The nose is 11 1/4”, the cheek pieces are 7 1/4”, and the crown (when buckled up) is 14 1/2”on the shortest setting and 21”on the longest. Lovely doubled & stitched dark leather show halter with silver hearts on cheeks & nose, double buckle crown, 3 way adjustable under chin, with rolled throat. Not stamped as to maker, this is a quality piece similar to Tory, Weaver, etc. Cheeks measure almost 7 1/4” long not including hardware & this fit a Class B miniature horse, so should fit a Pony, or Weanling Horse. Excellent used condition, leather soft & supple. Photo of this halter on a Mini Horse is available, just ask. 1/4” wide rolled leather noseband & cheeks with 3/8” flat leather crown, adjustable on top of crown to fit a variety of head sizes. Attached twisted silver chain throatlatch included. 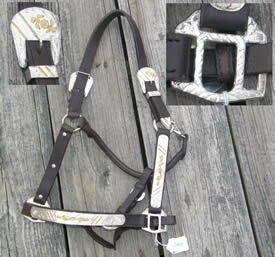 Congress Leather Show Halter Silver has black details. Has silver bars, buckles & etched rings. 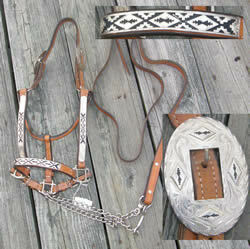 Double buckle crown, 3 way adjustable under chin, rolled throat. Comes with matching 1" leather lead & chain. Super nice, but either is missing 2 conchos on either side of noseband silver bar or bar had the ends cut off. Add 2 small conchos & you’ll be set to show. Circle Y dark brown leather show halter with scalloped silver trim on nose & cheeks, silver buckles, keepers & tips, double buckle crown, 3 way adjustable under chin, & rolled & wired throat. Silver is stamped Alpaca Mexico on the back & has a rope edged silver on throat piece stamped “Handmade by Circle Y“, leather on crown is stamped with Circle Y 383. Buckles are removable with Chicago screws. This was tried on a Class B size Miniature Horse & it fit, but should also fit a Horse Foal or Small Pony. Cheeks measure approx 6” long not including hardware. A few small minor scuffs to leather, end of silver trim on noseband has become detached from last Chicago screw. Super glue may keep it down, not sticking out far off noseband as it is now. 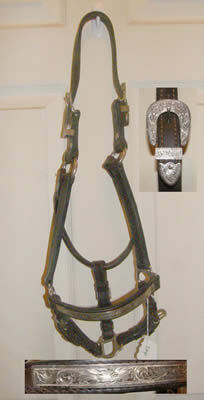 Photo of this halter on a B Mini Horse is shown. Unmarked, but looks like Billy Royal. 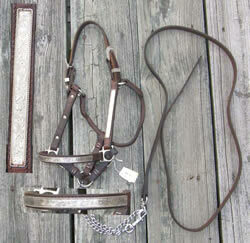 Quality leather show halter with silver trim, double buckle crown, 3 way adjustable under chin, rolled throat. Silver is NOT German silver, but looks like vintage stuff. Comes with 5/8" leather lead & narrow chain. 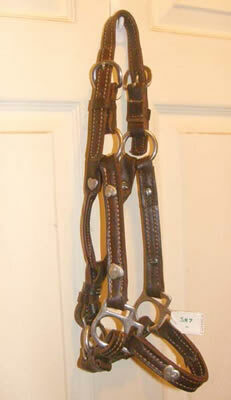 Quality leather show halter. Silver conchos, buckles, keepers & tips. All silver except buckles/keepers are NOT German silver, but older vintage stuff. Buckles/keepers look to be added later. Double buckle crown, 3 way adjustable under chin.